A sniper in the Canadian special forces shot and killed an Islamic State (IS) fighter from a distance of 2.1 miles (3,540m) in Iraq last month. Military sources told Toronto's Globe and Mail newspaper the soldier was a member of Joint Task Force 2, and made the shot from a high-rise building. It took the bullet almost 10 seconds to hit its target, it reports. 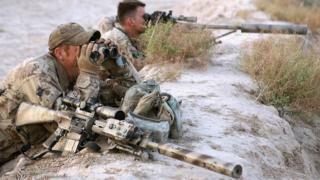 The Canadian Special Operations Command confirmed to the BBC the sniper "hit a target" from that distance. The shot, which sources tell the paper was filmed, is thought to be a record for the longest confirmed kill. The sniper worked in tandem with an observer, who helps to spot targets, and used a standard Canadian military issued McMillan TAC-50 rifle. "The shot in question actually disrupted a Daesh [so-called Islamic State] attack on Iraqi security forces," a military source told the paper. "Instead of dropping a bomb that could potentially kill civilians in the area, it is a very precise application of force and because it was so far away, the bad guys didn't have a clue what was happening." The source described the difficultly of the shot, which required the shooter to account for wind, ballistics, and even the Earth's curvature. Military experts believe the successful shot may have set a record. The previous record was held by British sniper, Craig Harrison, who shot and killed a Taliban attacker from 2,475 metres in 2009 using an L115A3 long range rifle. The government of Canada's Liberal Party Prime Minister Justin Trudeau halted air strikes against the so-called Islamic State in 2016. But at the same time, Mr Trudeau announced plans to treble the number of special forces on the ground, as well as increase the number of Canadian Armed Forces members who are tasked with training and assisting local forces.